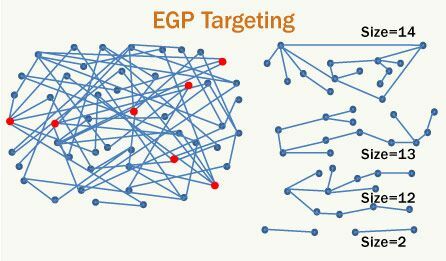 Researchers are now proposing a new strategy for targeting shots that could, at least in theory, stop a pandemic from spreading along the network of social interactions. Vaccinating selected people is essentially equivalent to cutting out nodes of the social network. As far as the pandemic is concerned, it’s as if those people no longer exist. The team’s idea is to single out people so that immunizing them breaks up the network into smaller parts of roughly equal sizes. Computer simulations show that this strategy could block a pandemic using 5 to 50 percent fewer doses than existing strategies, the researchers write in an upcoming Physical Review Letters. Has the BioShield program given any thought to accumulating and stockpiling vaccines for various pathogens? That might be a reasonable use of resources.